The world is getting fatter. One billion people are overweight, and 300 million of those are clinically obese. The search is always on for replacements for those things that, eaten in excess, make us obese - fatty and sugary foods. There is no miracle pill that can replace either. Nearly four decades ago one man came close to providing a tablet that could reduce our love of sugar. In the 1960s, Robert Harvey, a biomedical postgraduate student, encountered the miracle berry, a fruit from west Africa which turns sour tastes to sweet. "You can eat a berry and then bite into a lemon," says Harvey. 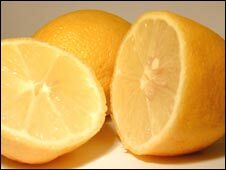 "It becomes not only sweeter, but it will be the best lemon you've tasted in your life." More importantly, this "miracle" can be used to manufacture sweet tasting foods without sugar or sweeteners, which have always been plagued by an after-taste. 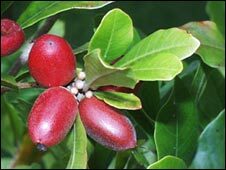 Spotting the potential health benefits, and the healthy profits, that the miracle berry promised, Harvey founded the Miralin Company to grow the berry in Jamaica and Puerto Rico, extract its active ingredient in laboratories in Hudson, Massachusetts, and market it across the United States. At first, Harvey aimed his products at diabetics. "In market testing, diabetics thought our product, as the name implies, was a miracle." But Harvey's sweet dream of making the world healthier came to an abrupt end. 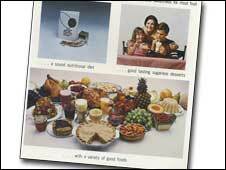 On the eve of the launch in 1974, the US Food and Drugs Administration unexpectedly turned against the product. Legal advice and contact with the FDA had led Harvey to believe that the extract from the berry would be allowed under the classification "generally recognised as safe". Having been eaten before meals for centuries in west Africa, without anecdotal reports of problems, it could be assumed not to be harmful. But the FDA decided it would be considered as an additive which required several years more testing. In the poor economic climate of 1974, this could not be funded and the company folded. "I was in shock," says Harvey. "We were on very good terms with the FDA and enjoyed their full support. There was no sign of any problem. Without any opportunity to know what the concern was and who raised it, and to respond to it - they just banned the product." He remembers a number of strange events leading up to the FDA's decision, beginning immediately after one particular market research test. His investors, including Reynolds Metals, Barclays and Prudential, had put up big money. They were looking for big returns. "From the beginning my interest was in the diabetic market but my backers wanted to put double zeros after the numbers we were projecting." So, in the summer of 1974, miracle berry ice lollies, in four different flavours, were compared to similar, sugar-sweetened versions by schoolchildren in Boston. The berry won every time. Don Emery, then vice president of the Miralin company, recalls the excitement. "If we had got beyond the diabetic market we could have been a multi-billion dollar company. We'd have displaced maybe millions of tons of sugar and lots of artificial sweeteners as well." A few weeks later, things turned sour. A car was spotted driving back and forwards past Miralin's offices, slowing down as someone took photographs of the building. Then, late one night, Harvey was followed as he drove home. "I sped up, then he sped up. I pulled into this dirt access road and turned off my lights and the other car went past the end of the road at a very high speed. Clearly I was being monitored." "I honestly believe that we were done in by some industrial interest that did not want to see us survive because we were a threat. Somebody influenced somebody in the FDA to cause the regulatory action that was taken against us." The Sugar Association, the trade body representing "Big Sugar" in the US, declined to be interviewed on the subject but flatly denied that the industry had exerted any influence over the FDA. The Calorie Control Council, which represents artificial sweetener manufacturers in the US, has failed to respond to questions on the issue. The Food and Drugs Administration also refused to be interviewed and has indicated that a Freedom of Information (FOI) legislation request to look at the relevant FDA files will not be considered for a year. Robert Harvey had requested the same files over 30 years ago. "We got back the most redacted information I've ever seen from FOI. Everything was blacked out. There would have been material in the file that would have embarrassed the FDA, I believe." Faced with this silence, it's virtually impossible to assess what actually happened to prevent the miracle berry's progress to a sugar-free market. But one thing is certain, it never got the chance to prove whether it really would have provided a miracle in our ever fattening world. And for Robert Harvey, that's the biggest shame of all. "It was a big loss not only for my employees and shareholders but, even more importantly, for diabetics and other people with special dietary needs. It was tragic." But all hope is not lost for the berry's champions. Today a firm called MiracleUK sells the active ingredient online. Dieters will watch the outcome closely.